The flag of Liberia was adopted in 1847. It consists of 11 horizontal red and white stripes, with a white star on blue canton. It is strongly reminiscent of the American flag because the country was created in 1822 by the NCSA, an american colonisation society. The star on blue background is a reminiscent of Old Glory. the original 13 bands were replaced by 11 bands to avoid confusion with the American flag, and to recall the 11 members of the Commission that declared independence in 1847, after a period of autonomy. You can download it in different sizes, in a decidedly modern design for your personal use, or for wider use. Liberia's flag is available in 4 different sizes. 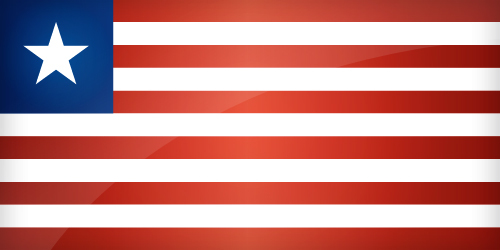 Keywords: Flag liberia wallpaper, Liberian, Republic of Liberia, National liberian flag, banner, pictogram, country, icon, Liberia icon, international, Monrovia, Monrovia, Gbarnga, Kakata, Asia. This page has been viewed 3659 times.